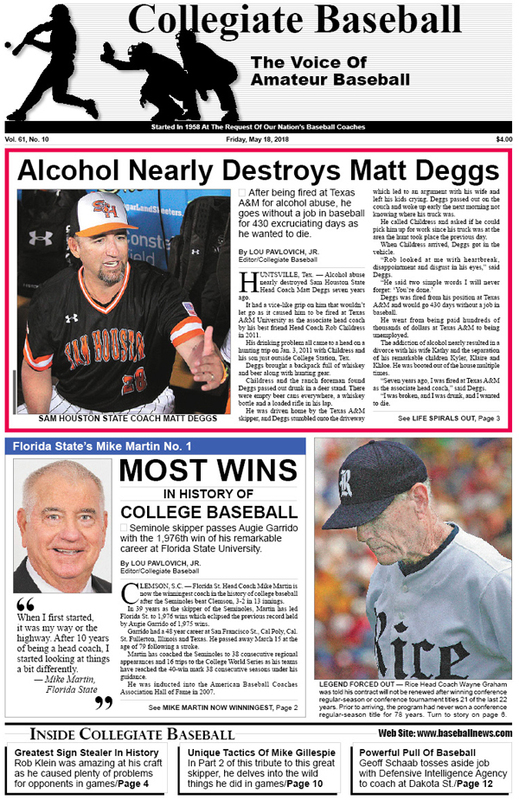 • Alcohol Nearly Destroys Matt Deggs: After being fired at Texas A&M for alcohol abuse, he goes without a job in baseball for 430 excruciating days as he wanted to die. • Most Wins In College Baseball History: Florida State skipper Mike Martin passes Augie Garrido with the 1,976th win of his remarkable career. • Legend Forced Out At Rice: Wayne Graham was told his contract will not be renewed after winning conference regular-season or conference tournament titles 21 of the last 22 years. Prior to arriving, the program had never won a conference regular-season title for 78 years. • Greatest Pitch Picker In History: Rob Klein, who was a detective for the Los Angeles County Sheriff’s Department and coached with Mike Gillespie as an assistant, could dissect what pitches were coming as he broke down every facet of the pitcher’s delivery. • Editorial: Alcoholism destroys lives of loved ones. • Survives Cancer: Michigan catcher Brock Keener has overcome serious obstacles in his life. • $1 Million Donation: Roger and Debbie Clemens donate $1 million toward a $9 million project to support the future of the University of Texas baseball program. • NCAA Div. I Notes: Back surgery doesn’t stop Fordham RHP Ben Greenberg who has been remarkable during 2018 season, trio of Bogart brothers hit a home run on the exact same day, David Hamilton of Texas belts walk-off grand slam in the bottom of ninth to beat Texas State, plus much more. • Collegiate Baseball NCAA Div. I Top 30 Presented By Big League Chew: Stanford (37-6) wins 14 of 15 to rank No. 1 in the nation and also is No. 1 in USA with superb 2.60 team ERA. • Mike Gillespie’s Baseball Tactics: Remarkable Hall of Fame skipper from U.C. Irvine explains why he put a fifth infielder 15 feet from home plate near the third base line in defensing an all-world bunter, the value of 4-man outfields and how he utilized the bunting game with such precision. • Collegiate Baseball’s National H.S. Poll Presented By Diamond Pro: Calvary Christian (Clearwater, Fla.) keeps rolling with 27-0 record and 57-game winning streak dating back to 2017. • High School Notes: Pleasure Ridge Park H.S. (Louisville, Ky.) Head Coach Bill Miller, the winningest baseball coach in Kentucky history, loses his battle with lung cancer. • NAIA Notes: Geoff Schaab gives up a lucrative job at the Defense Intelligence Agency working on North Korean military and counter terrorism issues as he is pulled back to baseball as the head coach of Dakota State, Woody Hunt of Cumberland University wins his 1,500th victory, plus much more. • Junior College Notes: RHP Tanner Gordon of John A. Logan College strikes out 19 Olney Central College hitters, Jones County RHP Will Freeman fans 18 batters, plus much more. • Ruleball With Rich Marazzi: There is much more to force plays than you might think. • Charlie Greene: Concussions happen way too often in baseball as athletes must be given special care. • NCAA Div. 2 Notes: After 31 years at Mount Olive, Carl Lancaster will step down, Drake McNamara of Southern Indiana belts 8 home runs and collects 17 RBI over 5 games, plus much more. • NCAA Div. 3 Notes: Southern Maine’s Ed Flaherty celebrates 1,000th win, Jesse Russo of SUNY Old Westbury has remarkable season as he hits .391 with 19 doubles, Cam Graham of Husson fires a no-hitter, plus much more. To purchase the May 18, 2018 edition of Collegiate Baseball or subscribe, CLICK HERE.